The excitement is THICK as the Coal City prepared to play host to Nigerian Idol, Africa’s biggest music reality show on the 28th and 29th of October. 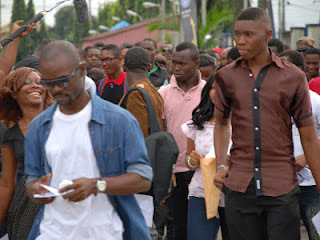 The global music phenomenon holds Season II auditions in Enugu at the Universal Hotel in Independence Layout. The winner of the show takes home a whopping new prize valued at $100,000 which includes a management contract, prize money, and a recording contract. Everybody is a winner this time around as the runners- up and each of the top ten finalists also win mouth watering prizes. The Idol franchise is the world’s biggest and most popular music platform responsible for the discovery of musical heavyweights like Jennifer Hudson, Carrie Underwood, Ruben Studdard, Adam Lambert, and more recently, Nigeria’s own Yeka Onka. Idols enjoys a cult following in countries like the USA, the UK, China, the UAE, South Africa and Nigeria. The audition train will end after a 3 day audition finale at the Dream Studios in Lagos on the 4th, 5th, and 6th of November. 2. Confirm your Audition location, by sending an SMS from your Etisalat line with your FULL NAME & PREFERRED AUDITION CITY to 5599. 3. Show up at the audition venue with the ETISALAT SMS confirmation, a printed copy of your application form and 2 passport photos.